The information and advice contained in or made available through this Web site is not intended to replace the services of a trained health professional or to substitute for the medical advice of physicians. Site visitors should regularly consult physicians in all matters relating to personal health, and particularly in regard to symptoms that may require diagnosis or medical attention. 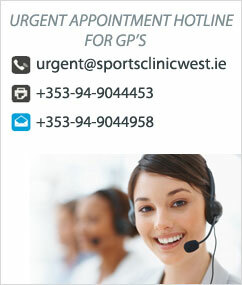 Sports Clinic West make no representations or warranties with respect to any treatment, action, or application of medication or preparation by any person following the information offered or provided within any pages linked to this site. Sports Clinic West will not be liable for any direct, indirect, consequential, special, exemplary, or other damages arising therefrom. Each time you visit a physician or other healthcare provider, a record of your visit is made. Typically this record contains your symptoms, examination and test results, diagnoses, treatment, and a plan for future care or treatment. This information, often referred to as your health or medical record, serves as a basis for planning your care and treatment and serves as a means of communication among the many healthcare professionals who contribute to your care. Understanding what is in your medical record and how your health information is used helps you to ensure its accuracy, better understand who, what, when, where, and why others may access your health information, and make more informed decisions when authorizing disclosures to others. We, at Sports Clinic West pledge to provide you with the highest quality of care and to build a relationship that is based on trust. This trust includes our commitment to respect the privacy and confidentiality of your health information. 3. What your rights are with regard to your medical information. When you need health care, you give information about yourself and your health to doctors, nurses, and other health care workers and staff. This information, along with the record of care your receive, is "protected health information" (or "health information). This information is kept in a paper form such as your medical record and in an electronic form on the computer. (A) Sports Clinic West uses and discloses (shares) health information for many different reasons. For treatment. We may use medical information about you to provide you with medical treatment or services. We may disclose (share) medical information about you to other doctors, and health care providers involved in your care. For payment. We may use and disclose (share) your health information in order to bill and collect payment for the treatment and services provided you. For health care operations. We may disclose (share) your health information for activities that are known as health care operations. We may also share your health information with outside parties ("business associates") who perform services on behalf of Sports Clinic West. These business associates must agree to keep your health information private. Examples of activities that make up health care operations include; legal counsel, transcription, storage, auditing, and consulting services. (C) Other Specific Uses and Disclosures that DO NOT REQUIRE YOUR CONSENT. (c) When disclosure of health information is required by state, or local law, administrative or legal proceedings, irish medical Council, or by the Gardai. (d) For public health activities. As required by law, we may disclose your health information to public health or legal authorities charged with preventing or controlling disease, injury, or disability. (e) For business associates. There are some services provided in our practice through contracts with business associates. Examples include labs, PT, home health care, etc.. When these services are contracted, we may disclose your health information to our business associates so that they can perform the job we have requested them to do and, bill you or a third party payer for services rendered. (g) For specific government functions. We may disclose health information of military personnel and veterans in certain situations. (h) For worker's compensation purposes. We may provide health information to the extent authorized by and to the extent necessary to comply with laws relating to worker's compensation or other similar programs. (C) The Use and Disclosure Requiring You to Have the Opportunity to Object. Disclosure to family, friends or others. Sports Clinic West using its best judgement, may disclose health information to a family member, friend, or other person that you indicate, unless you object in whole or in part, health information relevant to that person's involvement in your care or payment related to your care. The opportunity to get your authorization may be obtained retroactively in emergency situations. (D) All Other Uses and Disclosures Require Your Prior Written Authorization. In any other situation not described in sections 1 (A) through (C), we will ask for your written authorization before using or disclosing any of your health information. • Make sure that medical information that identifies you is kept private. and why we use and/or disclose (share) your health information. • Follow the terms of the Notice currently in effect. However, we reserve the right to change our privacy policies and the terms of this notice at any time. Any changes will apply to the health information we already have. Before any important policy change goes into effect, we will change this Notice, the new Notice will be posted on our web site www. SportsClinicWest.com and in a clearly visible location within our practice site(s) for public viewing. (B) Request Limits on Uses and Disclosures of Your Health Information: You have the right to ask for restrictions on the use and disclosure (sharing) of your health information for treatment, payment or health care operations. We will consider your request but are not legally required to accept it. If we accept your request, we will put any limits in writing and abide by them except in emergency situations. You may not limit the uses and disclosures that are legally required or allowed to make. (B) The Right to ask that Your Health Information Be Communicated to You in a Confidential Manner: You have the right to ask for your health information to be sent to you in different ways. For example phone, or only call at your home rather than at work. Your request must be in writing and explain the method of contact and location where you wish to be contacted. We will try to honour your request as long as we can easily provide it in the format you request. (C) The Right to See and Get Copies of Your Health Information: In most cases, you have the right to look at or get copies of your medical details that we have, but you must make the request, in writing. We will respond within thirty (30) days from the receipt of your request. If you ask for a copy of your records, you may be charged a nominal fee. (D) The Right to Receive an Accounting of Disclosures (a record of when and to whom, your health information was shared without your authorization). You have the right to obtain a list of the instances that we have shared your health information. You must make this request in writing. If you think that Sports Clinic West may have violated your privacy rights, or your disagree with a decision we made about access to your health information, you may file a complaint with Mr. O’Grady directly.